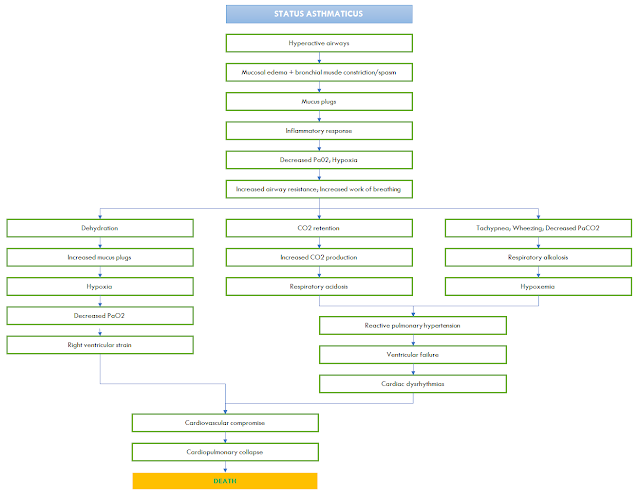 Status asthmaticus is a critical emergency that requires prompt intervention to avoid acute and possibly fatal, respiratory failure. In this condition, the asthmatic attacks are unresponsive to medical therapeutics, with severe bronchospasms creating decreased oxygenation and perfusion. During an acute asthmatic attack, the individual may demonstrate varying degrees of respiratory distress depending on the duration of the attack, and the severity of spasm. 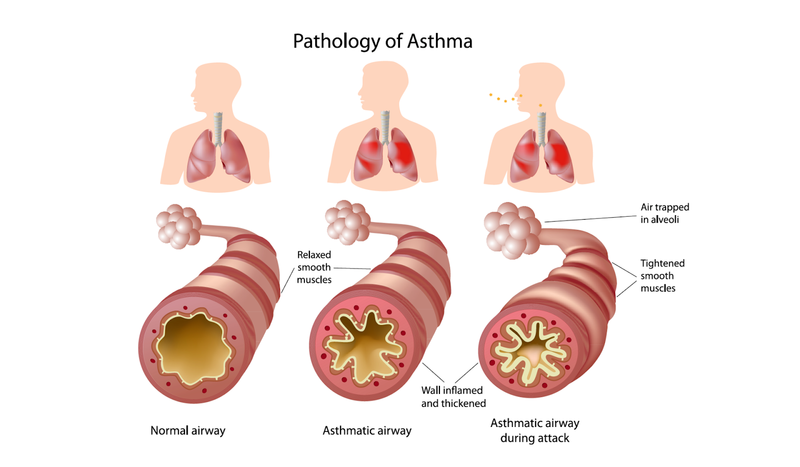 The underlying cause of asthma is still as yet unknown, but is thought to be due to imbalances in adrenergic and cholinergic control of the airways, and their response to the allergens, infections, or emotional factors with which they come in contact. Intrinsic asthma occurs when the triggering factors are irritation, infection, or emotions, and extrinsic asthma occurs when precipitated by allergic or complement-mediated factors. Asthma may be drug-induced by aspirin, indomethacin, tartrazine, propranolol, and timolol. In asthma, the airways are narrowed due to the bronchial muscle spasms, edema, inflammation of the bronchioles, and thick, tenacious mucous pro- duction. The narrowing leads to areas of obstruction and these become hypoventilated and hypoperfused. Eventually a ventilation/perfusion mismatch occurs and may lead to hypoxemia and an increasing A-a gradient. When PaCO2, rises to the point of respiratory acidosis, the patient is then considered to be in respiratory failure. The three most common causes of status asthmaticus are allergen exposure, noncompliance with medication regime, and respiratory infection expo- sure. Environmental factors, such as excessively hot, cold, or dusty areas, may initiate status asthmaticus because of the effect they have on the air that is breathed. Wheezing may occur not only with asthma, but with chronic obstructive pulmonary disease, congestive heart failure, pulmonary embolism, and tuberculosis, and these diagnoses should be ruled out. Patients who have status asthmaticus suffer pronounced fatigue due to the continuous efforts of breathing, and they easily become dehydrated due to the hyperpnea. The patient usually has dyspnea, tachypnea, wheezing, tachycardia, pulsus paradoxus, and severe anxiety. The goals of treatment include ventilatory support and maintenance of adequate airways, and the prevention of respiratory failure or barotrauma. Patient will maintain patency of airway and will be able to effectively clear secretions. Nebulizers are usually the first line treatment for asthma. Aminophylline is frequently prescribed to relax bronchial smooth muscle and mediates histamine release and cAMD degradation, which facilitates improved air flow. Therapeutic levels range between 10-20 mcg/ml. Symptoms may indicate theophylline toxicity, which will require titration of the drug dosage. Epinephrine is usually given SQ every 20-30 minutes for 3 doses as needed to relieve bronchoconstriction. Terbutaline is usually not the first drug of choice in acute situations due to the delayed onset of action, but is frequently used after the patient shows improvement. Assist/administer inhalation therapy as ordered. Nebulizers and intermittent positive pressure breathing treatments may be used in mild to moderate episodes but should not be used during acute attacks because of the potential for bronchospasm in response to the aerosol agent. Monitor for side effects, such as tachycardias, tremors, nausea, vomiting, or bronchospasm. May occur as adverse reactions from medications. May require change in specific drug used. · Patient will maintain patent airway and be able to cough and clear own secretions. · Patient will have clear breath sounds with no adventitious sounds or airway compromise. · Patient will have adequate oxygenation.